Rachel Marie Webb, 97, of Rockford, Ohio, died Tuesday evening, September 18, 2018, at the Laurels of Shane Hill in Rockford. She was born on January 8, 1921, in Nobel Township, Auglaize County, Ohio, to Ralph C. and Margaret (Schillinger) Brodbeck. She was a graduate of Neptune High School, Class of 1938. On May 29, 1940, she married John C. Webb, and he proceeded in death on May 5, 1994. 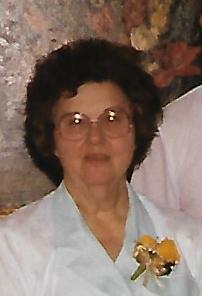 Rachel retired from the Rockford Post Office where she had been a postal clerk. Rachel never failed to have a smile for everyone who walked through the door, along with a friendly greeting. She lived the majority of her life in the area, making her home with John in Rockford. She was a member of the Rockford United Methodist Church, the 20th Century Club, and the Eastern Star in Rockford, and later in Celina. Surviving is a sister-in-law, Bonnie Miesse of Celina, Ohio and 7 nieces and nephews: James F. (Pat) Now, Rosemary “Sue” (Claire) Stetler, Dr. Joseph (Evelyn) Now, Lois Ann Armstrong, Joyce (Terry) Finke, Kristine (Rev. Nick) Doversberger, and Dr. Rev. Mark (Barbara) Brodbeck. Deceased in addition to Rachel’s husband, John, is a brother, Eugene Brodbeck and his wife, Onnolee; her sister, Naomi Now, and 2 brothers-in-law: James W. Now and Melitis Miesse. Funeral services for Rachel will be held on September 24, 2018, at 11:00 a.m., at the Rockford United Methodist Church, with Dr. Rev. Mark Brodbeck and Pastor Chip Steffy officiating; burial will take place at 1: 30 p.m. at Elm Grove Cemetery in St. Marys, Ohio.